Vern Burkhardt (VB): Did you discover the power of visual thinking by portraying a problem on the back of a napkin? Dan Roam: I hate to say it, but I did not. It would be wonderful to be able to say that I have my own back of the napkin 'aha' sketch. I discovered the power of visual thinking by drawing on everything I happened to have nearby ranging from notebook paper to a chalkboard. At some point in the past it may have included a napkin, but I don't recall that being the quintessential proverbial starting point. It was in March 1981 that I first recognized the power of a picture, not so much for solving a problem, but for communicating a concept to someone else. While a junior in high school in Billings, Montana I went as an exchange student for a year to a little town just North of Bangkok, Thailand. When I arrived in Thailand, my Thai language skills were non-existent. The family I was supposed to be billeted with included an English-speaking teacher, but at the last minute I was placed with a family where no one spoke English. You can see where this is going. I found myself in a country with a culture, language, and society that was completely foreign to me. I didn't have the ability to communicate in my native language, and the people around me were unable to communicate with me in their language. Since I had always drawn, I found it extraordinarily easy to draw simple, little sketches and have a conversation with virtually anyone. The conversation could go in many directions. I'd draw a little picture of a house and it became reasonably clear right away that I was drawing a picture of my house in the U.S. Then I'd draw a picture of a number of little stick figures with an arrow pointing to one, and people figured out quite quickly I was describing the size of my family. I began to realize that, at least in a multi-cultural or multi-language context, pictures are extraordinarily powerful for communicating. I didn't recognize I was doing anything particularly compelling at the time, nor did I muse that it was probably something people all over the world do to communicate. It took another 20 years to realize, in hindsight, that it was a breakthrough insight for me. VB: What is visual thinking? Dan Roam: There are many different answers to that question. I'll give you mine. It means taking advantage of our innate ability to see, with both our eyes and our mind's eye, in order to discover ideas that would have been invisible if we had just talked about them. Visual thinking is developing ideas very quickly by sketching them out. It includes using pictures to communicate these ideas to someone else in a way that enables them to quickly grasp the concepts. Dan Roam: It's the ability we have to see when our eyes are closed. From a neurobiological perspective, it appears that in many cases the visual processing system in our brains that is kicked into gear when we look at things is also kicked into gear when we simply think about those things with our eyes closed. The easiest example is when we are dreaming—everybody has had a very vivid dream at some point in life. The visual processing neurons are being activated during our dream the same as if we were actually looking at the objects. I want to study in more detail the mind sight of visually impaired, visually disabled, and blind people. I have read a few interesting studies suggesting that how their 'mind's eye' functions very much depends on the nature of their visual impairment or visual difference. It seems the visual processing centers can be as active for visually impaired and blind people as they are for people who have full sight. The short answer is the mind's eye is the place inside our heads that allows us to look at things, manipulate them, see their different sides, and turn them upside down and shake them, without needing to have the object physically in front of us. It's something we are all extraordinarily good at. In fact, if we did not have this ability, we would not be able to make it through the day. VB: Why is drawing pictures so powerful in helping us clarify our own ideas? Dan Roam: We can contrast drawing pictures with the typical brainstorming approach, which is, "Let's sit in a room and talk about stuff". We are exceptionally good at talking and thinking verbally, but talking about things activates only a limited number of processing centers in our brain. When we talk about something and draw it at the same time, or when we talk about something and see it at the same time, we double, triple, quadruple, or more, the number of active channels and processing areas in our brain. If I said, "Vern, I want you to imagine an apple" your mind's eye will begin to picture what an apple might look like. But if I said, "Imagine an apple" and at the same time drew a little circle with a line on the top to look like a stem, maybe a bite out of one side, I'd not use the term 'infinitely greater', but certainly orders of magnitude more neurons in your brain are going to start firing when they hear apple and see the drawing of the apple at the same time. The power of a picture is that it opens up more channels in our brain allowing us to think about things in ways that would lie dormant if we were just talking about them. Of the neurons in our brain that are processing incoming sensory information, somewhere between one half and three quarters are focused on vision. That tells us a couple of things. Vision is very complicated. Vision must be important to our thinking ability since we have evolved to have an extraordinary capacity in our brains to process what we see. The ultimate question is why aren't more people using pictures in business? Visual thinking is the thing we are absolutely the best at. The fact that we do not exploit and use vision more for discovering, developing, and sharing ideas in a business context is just plain silly. VB: It is not encouraged in business schools. Dan Roam: Precisely. For good or bad, business defines success almost entirely in quantitative terms. A business is considered successful if it meets certain numeric parameters. These include things like price-earnings ratio, stock price, and market share. These are just numbers. Yet in business school we are taught to manage a business and judge its success based on little more than keeping track of the numerical aspects of the business. When people in a business meeting talk about ideas, concepts, or strategies, there's a lot more going on than just numbers. Apple is an overused example, but it's one of my favorites because it's so visual. Apple, from a numeric perspective, has been both successful and a failure at different points in its lifespan. It would be unfair to judge Apple's success based solely on its numbers. The real success of Apple has nothing to do with percent of market share or ROI. It has to do with the incredible ability of many people at Apple, led by Steve Jobs, to see something that needs to be made and then create it in a qualitatively better way than anybody else. That's the piece business schools are missing. VB: "Any problem can be helped with a picture". Are some problems better solved with pictures than other problems? Dan Roam: To the degree that any problem can be solved at all, I believe it can be solved effectively through the use of a picture. There are unsolvable problems, and no picture is going to help solve them. Interestingly, those tend to fall into the categories of politics or emotions, where we are likely to act based on a gut feeling or a very deep, perhaps hidden, need that can never really be rationalized. We have the ability to articulate infinitely more clearly what a problem is all about if we bring pictures into the game. That said, certain types of problems lend themselves more towards the use of a picture. Ironically, those are the kind of problems where a picture is often least likely to be used. As an example let's consider a business strategy problem, such as where is my company going to be in five years? That's the kind of question, whether you're a MacKenzie consultant or the leader of a company, you ought to be thinking about all the time. Where should my company be in five years is the ideal opportunity to bring pictures into play—very simple pictures. A circle that represents the market as it is today. Another circle far off to the left that indicates this is where the market might be tomorrow. Another circle in the middle that portrays where our business is now. Another set of circles that indicate this is where my competition is. And another that says, here is where my potential customers are. The creation of that kind of picture, guaranteed, will deliver insight that would remain completely invisible if people were just looking at spread sheets and creating bullet lists. Yet, it is in business strategy that you are least likely to find someone drawing pictures. When you do find a strategic thinker who uses simple pictures or maps, they tend to be extraordinarily powerful. I am thinking of people like Charles Schwab, who thought differently because he often thought with simple pictures. He was able to redefine stock brokerage. Another is Steven Pratt, CEO of Infosys Consulting, which is the American consulting division of Infosys Technologies Limited. It's one of India's largest technical outsourcing companies. Steven Pratt, whom I have worked with on a number of occasions, is one of the best strategic thinkers I have ever met. He draws everything, and he draws it very simply. The reason I bow at the feet of Steven Pratt is because he is one of the few CEO's I have seen who will go into a meeting with a colleague CEO, someone of equal level—we're talking multi-billion dollar decisions and he'll draw a picture in front of that other CEO, they will bond, and the conversation will go where it needs to go. It is amazing to see. VB: What are the key attributes of a good problem-solving picture? Dan Roam: Any good problem-solving picture is going to include at least four of six essential components, what I call the six ways of seeing. They relate to the key one-word questions we learned in grade five English class—who, what, where, when, why, how, and how much. A good problem-solving picture will include who is involved, and what those people are doing or what they are supposed to deliver. The next aspect is how much—how many are we talking about? The third piece is where are they located physically, spatially, or even conceptually? The fourth is when do they interact? The fifth type of information is how do they interact? The sixth is why do they interact at all? This sounds, when I describe it with words, overly complicated, but when you see it in a simple picture it makes the problem exceedingly clear. A problem solving picture will break the problem down into those different types of information, help us see each type, and then let our mind put together the interactions of each type in order to answer the ultimate question, "Why is any of this happening to begin with?" VB: Visual thinking enables us the see the whole picture. Would you explain how that works? Dan Roam: There is a compelling argument that we think in either a linear or a verbal way. Think of a typical cookbook description of how to make macaroni and cheese. It tells you step-by-step how to do it. But it doesn't tell you what finished mac and cheese actually looks or tastes like. In order to know that, we have to shift to the second way of thinking—a more spatial way. Rather than thinking of macaroni and cheese as a set of tasks that need to be done in sequence, it thinks of macaroni and cheese as a beautiful bowl of lovely noodles. You see the entire picture. Ninety-nine percent of business communication is focused solely on the linear bullet list approach to macaroni and cheese. How tasty would macaroni and cheese be if the only way you ever thought about it was in terms of the list of steps required to create it. It would be terrible. We need to introduce into business more spatial thinking that says, when I am done with this list, with the linear thinking, what will I actually have? How will all those pieces and steps come together to create something that wasn't here before? I'm not talking about the steps of how to get there. I'm talking about what the thing will be when it is done. Pictures, of course, are an excellent way to come up with spatial thinking. They are a powerful intersection between the linear thinking we need to do and the spatial thinking we need to get to. If I have a bullet list, it is one thing to write it down as a series of words: open package, put noodles in bowl, add cheese, and the remaining steps. But if we were to draw each step, what would they look like? We would create a series of simple pictures that would clarify what the steps actually mean, and open up our ability to think about our bowl of macaroni and cheese in a more spatial and holistic way. VB: People who are left handed are often thought to be right brain dominant, to be more creative. Are right brain dominant people better able to solve problems using pictures, or is this a myth? Dan Roam: It's infinitely more complicated than left brain versus right brain. There seems to be truth to the model that our brain likes to approach problems from two different perspectives, which we then merge to come up with an answer. We illustrate this by saying 'left brain people' are good at verbal linear thinking and are predominantly right-handed. And 'right brain people' are good at spatial synthetic thinking and are left-handed. President Obama, who is left-handed, draws quite a lot. It's not something the American people see, because, for reasons we could postulate about, we don't see him drawing in public. I think that's a mistake, because he's an extraordinarily good visual thinker. It would make a lot of the things that he says clearer. If you do a Google search for 'President Obama and drawings', or 'President Obama and sketches', you will come across a handful of his pictures. They are very good. The same is true of all of us. We are, to varying degrees, either more linear or more spatial in our thinking. If I were to get up on my soapbox I would say every one of us, regardless of our natural thinking style, could achieve a lot more in terms of good thinking and breakthrough ideas if we learned to be better at the spatial side. It's not hard to do even for the person who most adamantly says, "I am not a visual thinker." We all have the potential to be extraordinarily good visual thinkers. We just need to realize we have the ability, and practice in order to cultivate it. It's a simple thing to do. Creating pictures in our brain preceded our ability to talk by roughly 300 million years. We have a greater ability to think spatially than in a linear fashion. It is odd that we spend so much of our time on the linear side. VB: You don’t recommend using a computer for on-screen drawing and, instead, encourage relatively simple hand-drawn images. Does using a computer to draw tend to stifle visual thinking? Dan Roam: Yes. Leave the computer out of the room when you are in a brainstorming session, or when you are really trying to think. But I will add a footnote to that statement. I do consulting work with technology companies such as Microsoft and eBay, and I've done some work with Sysco. I have a high attachment to the computer as a means of doing business—I'm a true geek. I use a computer software program that allows me to draw three-dimensional pictures of spacecraft as a hobby. So I love my computers. But I also know that my brain is infinitely more powerful, flexible and capable than anything that can be developed in software. The reason I consider computer software, regardless of who made it, somewhat debilitating to us is because however well the software was created, it forces our brain to work with that piece of software according to its own design. Let's consider 'Word' as an example. In order for me to type using 'Word', I have to think within the limits of my typing speed. That restriction slows down hypotheses I have in my brain that are being created really fast. The same happens with a drawing program. It limits my ability to think, because my innate capability is far greater than anything that can be executed through a mouse or a keyboard. VB: Would you talk about the four steps to visual thinking—look, see, imagine, and show? Is "seeing what isn't' there" the most creative part for discovering new ideas? Dan Roam: Yes, I think it would be. There were a couple of factors at work as I was writing the book. I wanted to write a business book that would make sense to linear, analytic thinkers. I thought it was important to let them know this isn't a squishy, out-of-left-field, abstract concept. There is a process behind it. The first part of the process for visual thinking is to look at something, which is a shorthand way of saying we have to get information into our heads. Our eyes help us do that. Then we have to see it. Seeing is something different, because in seeing we let our minds work on recognizing the patterns that are visible in everything we look at. Once we have seen those patterns, it is what we do with them in our minds' eye—in the imagining step—that allows the magic to take place. Our experience, visual abilities, intuition, and intelligence—everything we are—comes into play during the mental manipulation of the pictures we have inside our head. We take a pattern we have seen and change it to make it a more interesting outcome. All of that could take place with our eyes closed. But it takes place especially well if we take pencil and paper, and sketch little circles, boxes, and stick figures. What did I see and what do I think I can do with what I saw? VB: Do men and women have different visual acuity—different abilities to look and see patterns? Dan Roam: I haven't seen a difference. In the last 15 years about two thirds of my clients who have hired me to talk to their teams about visual thinking have been women decision makers. There could be many reasons for this including women are better visual thinkers than men, but I doubt it. What probably explains this phenomenon is that even to this day women are still a minority in business. When a woman does achieve a position of power, I'm guessing she is going to look for every tool she can find to help her do the best possible job. But I don't know. It could be that women are extraordinarily better at visual thinking than men. VB: Could the visual thinking process you recommend be a differentiator in generating breakthrough ideas in business? Dan Roam: The ability to think visually and take advantage of our innate vision system is one of the great differentiators in our ability to solve problems and come up with good ideas, and then to convince other people to implement them. Having consulted for many years in different organizations, and presented to hundreds of different client companies, I can say the positive results of visual thinking are shockingly high. When I, or the team I was working with, drew simple pictures while making sales presentations to clients, we would be successful a lot more often than not. In fact, I can't think of a time when we made the effort to create and present a thoughtful, insightful, and simple picture and didn't win the engagement. Often sales people, more than anybody else, find this exciting. When meeting with a potential client, rather than pulling out the usual PowerPoint which is going to put everyone to sleep, you make the conversation two-sided. You say to them, "I have an idea. I was thinking about this". Then you draw a circle and say, "Here's your business, what would happen if we did this?" Then you draw a little picture off to the side to represent a different option. Wow, you are more likely to make the sale. VB: It stimulates their interest? Dan Roam: It makes for a real conversation. VB: What are some tips for creating pictures that sell ideas? Dan Roam: The number one thing is to get over any fears we have and start thinking by drawing. If we worry our drawing isn't good enough and think we can't show it to anybody, we might as well forget the whole thing. We just have to start drawing. If you are facing a problem, have something to sell, or have a concept you want to share but you fear drawing, I suggest doing the following, which is very simple. Draw a little circle in the middle of a piece of paper and give that circle a name. This is the way we start every problem-solving picture. It's a no-brainer. You don't have to think about what you are going to draw. Just draw a circle and give it a name, and the name typically will be whatever the topic is. It could be 'me', 'my business', 'today', or 'my product'. It should be the thing that really drives us or is our major concern. Once you have that circle, draw another circle and imagine what it would be. If the first circle is "me", the second might be 'my customer', 'my product', or 'my competitor'. Then think about the relative sizes of those two pictures? What's the connection between them? How far away from each other are they? Is there an arrow between them, and what does that arrow indicate? Even with only two circles on a piece of paper and one line connecting them, before you know it your brain is fully engaged. It quickly starts drawing other circles and lines. It becomes almost a matter of just holding on, because you don't know what ideas are going to come out. After only four or five minutes spent on the picture it's almost guaranteed there will be insights, connections, opportunities, or possibilities you would never have identified if you hadn't drawn the picture. VB: You’ve developed several visual thinking tools, such as the Visual Thinking Codex. Did you set out to develop them or did they emerge as part of your business consulting practice? Dan Roam: They emerged. During the last four years I realized I was using the same things over and over. I had reached the point where I knew what I was doing, and it then made sense to codify visual thinking and put it into a book. VB: Are these visual thinking tools difficult to learn and use? Dan Roam: No, it takes half a day in a perfect situation. At the outside make it two days. They are not difficult to learn and use because I don't tell you to do anything you don't already do every day. You just haven't been thinking about it. Everyday we look at things, see things, imagine patterns, and then try to shift them around. We need to learn to recognize that we are thinking visually, and maybe do it a little bit faster. It's shockingly powerful. It's also insanely easy for everybody. VB: You point out that in groups of six year olds everyone raises their hand when asked, "Can you draw?" By the time we are sixteen years old, very few do so. Does that change in attitude negatively affect our ability to be innovative and creative? If we become better visual thinkers, will our innovative and creative thinking abilities be enhanced? Dan Roam: The answer is "Yes" to both questions. The fact that some people are uncomfortable drawing is definitely a limiting factor in their ability to be creative and innovative. The flip side is also true. If we become comfortable making simple sketches in order to help ourselves think, we'll become better thinkers. I say this without hesitation because of the way our brain works. We're good at thinking in words. But we're even better at thinking in pictures. By not including pictures in our thinking process, we are not using three quarters of our thinking ability. All we need to do is pick up a pen and a piece of paper and make a circle, and we are going to unleash our creative thinking abilities. VB: Other professions use visual tools to explain complex ideas. Do you find business leaders are quick to adopt the visual thinking process, or are the examples in The Back of the Napkin the exception rather than the rule? Dan Roam: The majority of people I talk to gravitate towards using the visual tools immediately. Within days if not hours, they are sending me emails expressing appreciation for being shown how to use the visual thinking process. Generally one quarter of audiences are initially dubious and some remain dubious, if not outright hostile, to the idea. Often because they don't feel comfortable with the process, or don't believe it has value in their particular situation. Which may be true, although I can't imagine it. Luckily, those who are adamantly opposed are small in number. Unfortunately they often tend to be the people who, in business at least, have the most economic power. But there are many more people in business, including business leaders, who say, "Wow, this is going to help me think. I know that I will be more successful using this process". VB: Do you always use hand drawn pictures when making presentations rather than sophisticated tools such as PowerPoint—"death by PowerPoint"? Dan Roam: Yes. PowerPoint is just a tool. There has been a tendency in the last couple of years to blame PowerPoint for debilitating us, and making us stupid presenters. This type of criticism is unfair. PowerPoint is like a hammer. We wouldn't blame a hammer if the house we built fell down. We would blame the person who had been wielding the hammer. Similarly, we can't blame PowerPoint if our communications stink. The issue with PowerPoint is two-fold. We talk about "death by PowerPoint". This expression is shorthand for a presentation that is an endless number of pages of bullets or speaking points, resulting in a painful experience for the audience. Yet it is how 90% of business presentations are delivered—which is shocking. VB: There's little creativity involved. Dan Roam: There may be great creativity involved, but it isn't obvious. To be fair, there is tremendous creativity in somebody putting together 100 pages of bullet points. They've had to dig through a lot of material and devote a great deal of thought to putting it together. As an audience member my brain isn't willing to make the same trip through all that material to draw the same conclusions. As owner of the idea they have an obligation to me, the viewer and receiver of the idea, to make it resonate with me. The presentation is not about the presenter; it's about the audience and the issue. And this is the second problem with PowerPoint. It makes it too easy for presenters, when putting together presentations, to forget about the audience. PowerPoint makes it so easy for us to create bullet lists which, if used excessively, dumb down presentations. It even has automatic bullet list generators. It's not PowerPoint's fault when presentations have countless bullet lists. It's equally possible to insert pictures, photos, and video clips. VB: The problem with bullet lists is they don't engage the thinking process of the audience. Dan Roam: That's right. From a cognitive perspective, we've got to keep in mind that a 20-page presentation with five, six, or seven bullet points on each page will be ineffective. The human brain has the ability to pay attention to only the first three or four pages. Beyond that, our brain isn't going to take in new information unless one of two things happens—we get an emotional kicker, or something in the presentation matters to us personally. A really scary thing happens at conferences and business meetings, where a series of PowerPoint slides are presented. As a member of the audience we will groan and painfully sit through a 45-minute presentation, maybe taking a couple of notes while trying to pay attention. Then, when it's our turn to go up on stage, we do exactly the same thing—it fits my definition of insanity. VB: Would you give us some examples of the use of your visual thinking tools that made you especially proud? Dan Roam: I will give you two of my favorites. Both are ones I have been given clearance to talk about. The first is work I did for Wal-Mart. I helped them come up with a simple set of pictures to explain what they were doing from the perspective of environmental and business sustainability. Three years ago when Lee Scott, CEO of Wal-Mart, was saying, "Wal-Mart is serious about becoming an environmentally sustainable business", there was skepticism among many. I was asked to learn and understand what sustainability meant to Wal-Mart, and then come up with a series of pictures that could explain it to anyone who was interested. We created, with pictures, a simple working model of the global Wal-Mart supply chain that included everything from packaging, transportation, and electricity consumption to carbon output. It was composed of simple little pictures like those you would find in a child's game. The beauty of it was that by breaking it down into a simple set of pictures, it was relatively easy to imagine what would happen and what would be the impact if you changed any one of the steps in any one of the processes involved. The pictures were really loved by the folks at Wal-Mart. We created a website—this was 2 years ago. It became one of the flagship presentation tools for what environmental sustainability means, and I am very proud of that accomplishment. The second example may be of interest to coffee drinkers. I have done a lot of work for Peet's Coffee & Tea, a San Francisco Bay area company. It's actually second or third behind Starbucks in terms of number of coffee retail stores, but its less than 200 stores is just a fraction of Starbucks' 16,000. I worked with Peet's to help them come up with a simple picture explaining their business strategy, and how they could continue to grow without sacrificing the quality of their coffee. We created a simple picture showing how that would work. It met with a great response from the people at Peet's, and others they have shown it to. Those are just two, but they are a couple of my favorites. Dan Roam: I am two thirds finished my second book, which will be titled The Back of the Napkin Workbook. As the title indicates, it's an extension of the concepts and tools contained in The Back of the Napkin, but delivered through a series of exercises for the reader. It will be large format, and go into each tool in quite a bit more detail. While developing each tool to a level of greater detail for the new book, I've come to an increased appreciation for the power of these simple tools. They are more eye opening than I originally thought. Dan Roam: The projected date is early January 2010, but that is dependent on my getting the manuscript to Penguin on time. VB: It's been a pleasure learning about the benefits of drawing on the back of the napkin. Thank you. Dan Roam says pictures are useful for clarifying and resolving problems as varied as business issues, political deadlocks, technical complexities, organizational dilemmas, scheduling difficulties, and personal challenges. It's a delight to see in The Back of the Napkin how simple pictures can be used to solve problems such as, "Who are our customers? ", "Where is our business? ", and "How can we improve our business?". The visual thinking toolkit is summarized with a drawing of a Swiss Army knife. It's composed of three basic visual thinking tools, four steps of the visual thinking process, five questions to help us open our mind's eye, and six ways we see and the corresponding ways we show. "Any problem can be made clearer with a picture." Dan Roam is the founder and President of Digital Roam Inc, a management consulting company that helps business executives solve complex problems through visual thinking. 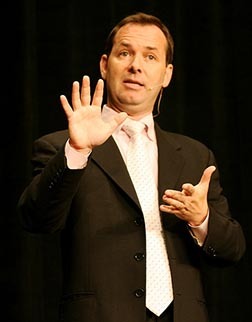 He lectures around the world for clients and at business conferences. Roam has lived and worked in Switzerland, Russia, Thailand, France, Holland, and the U.S. where he currently resides. Roam is the author of The Back of the Napkin: Solving Problems and Selling Ideas with Pictures (2008). He received two degrees at the University of California, Santa Cruz: one in fine art and the second in biology. I just finished reading your article "Problem Solving with Pictures" with Dan Roam on his book "The Back of the Knapkin". I enjoyed it as I have had similar experiences, as I'm sure we all have, in being put to sleep by over head presentations (back in the old days), or by Power Point presentations more recently. Similarly, I have also achieved greater break throughs in understanding by using pictures; both for my own edification and in communicating concepts. Thanks for keeping me on the mailing list for ideaconnection, I really enjoy reading your interviews and finding out about the concepts contained in the books you are reviewing.